Some of the best times are when life slows down for a bit and we just live in the moment. On the way home from Serafina's video filming with Actor's Edge, we stopped at the Avila Barn. We fed the animals, explored every nook and cranny, and... Took a hayride. 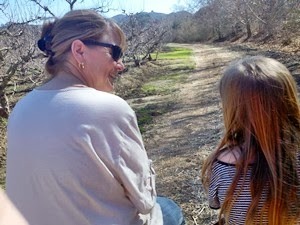 It was a great time for Nana and Serafina to chew the fat as they watched the world drift slowly by.